*Origin:* Found in rivers, lakes and ponds in India, Nepal and Pakistan. *Size:* Rather massive at up to 90cm/36". 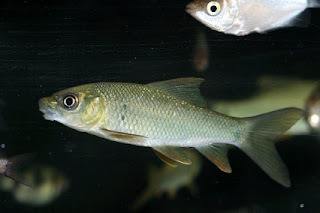 It is a popular food fish. were happily accepting flakes and frozen foods. these are very adaptable and were doing fine in hard alkaline water. 60cm/5' x 2' x 2' for a sub-adult. apparently, so some powerful filtration would be good. identifying this Labeo, which I'd first incorrectly keyed-out as L.
slightly smaller eye and a distinct fold in the lip. which were there in my specimens." Rao, it is not a common species in India. been identified by the supplier to anything below genus level. *Price:* Expect to pay about £10-20 each.